After years of paddling my kayak in the Winnipeg River and Pinawa Channel, sometimes alone I have finally learned how to do it. It has occasionally occurred to me when I’m out in our beautiful Manitoba wilderness in my little plastic kayak that maybe I should learn some basic skills. 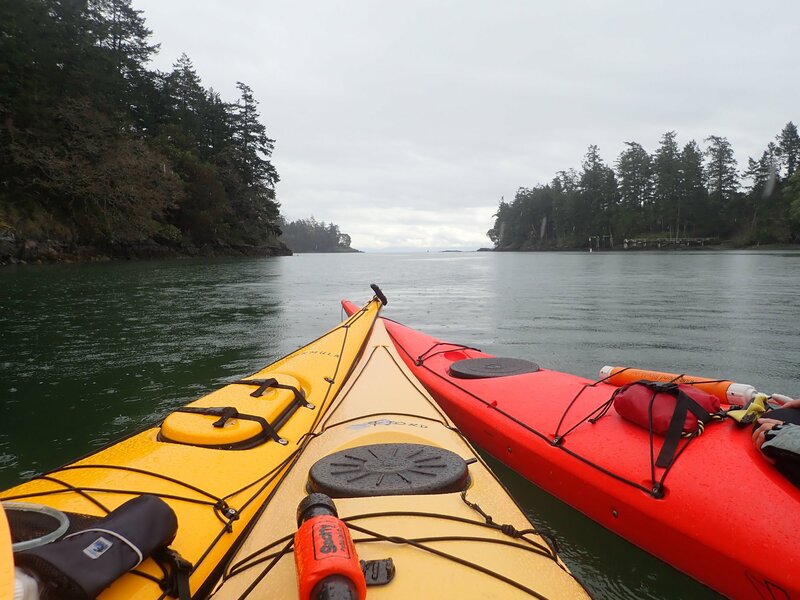 Ray and I discovered the Victoria Canoe and Kayak Club last fall, and joined right away. We put our names on the very long waiting list for kayak storage immediately, but then we found out that members can use the club boats for free; all we need is a Basic Kayaking certification. What a deal! Unfortunately we missed last years certification course by a couple of weeks, but we got into this years. 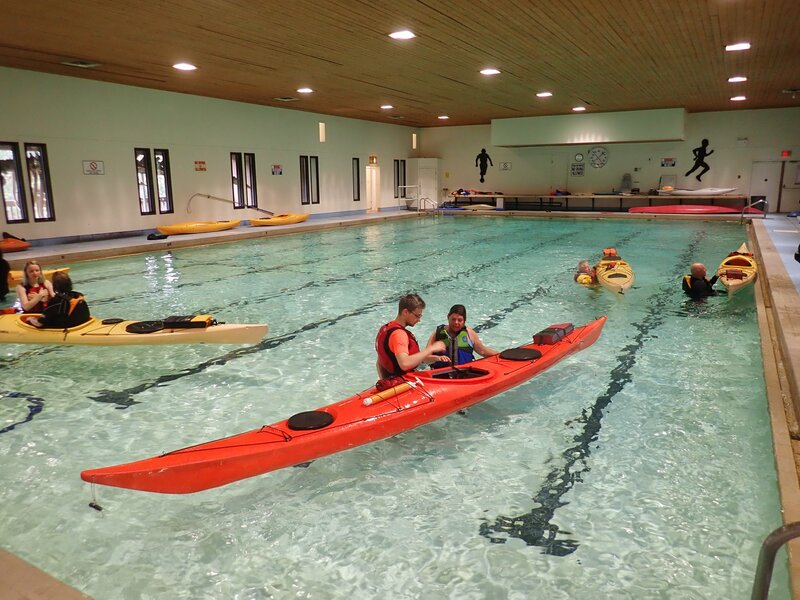 I cannot tell you how relieved I was to discover that part of our course would be in a swimming pool, specifically the part where we fall out of the kayak over and over. I heard they used to do this in the ocean. 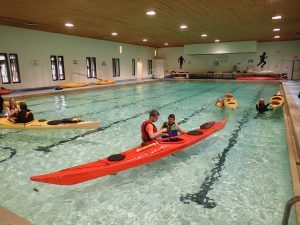 This year the VCKC used the facilities and instructors from Pearson College for our training. 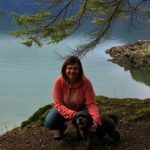 Located just a half hour drive from Victoria, Pearson College is located in the heart of a beautiful rain forest on Peddar Bay on the Juan de Fuca Strait. The College is an International Baccalaureate institution, and we had four young leaders help with our instruction; from Germany, UK, Africa and Canada. Our main instructor, Garth was also a teacher at the college. The Pinawa / Victoria parallels amaze me as I pictured the International school we’ve always talked about creating in Pinawa. Both are stunning locations. 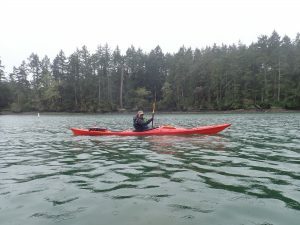 getting in and out of a kayak – I was really anxious to learn the proper way to get out of a kayak. I always just roll off on to the dock like a wet seal. Turns out this was exactly how the instructor described the technique. wet exit – this kept me awake the night before. Are we going swimming in the Pacific? A wet suit was on the required list. We spent 3 hours in a swimming pool practicing (thank goodness). We mastered a wet exit without an apron, with an apron and without losing hold of the paddle. Strokes – In the ocean we learned to paddle forward and backward, stopping and turning, pivoting and a couple of sideways strokes. Brave students learned the advantage of edging the kayak. 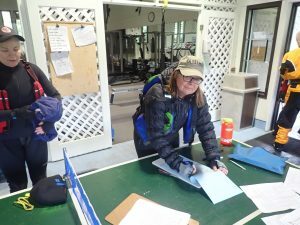 Map reading – when we finally left the water we had a couple of hours of classroom work. We studied the local map and learned how to judge distance and time. We learned very rudimentary tide symbols and how to find places to land. 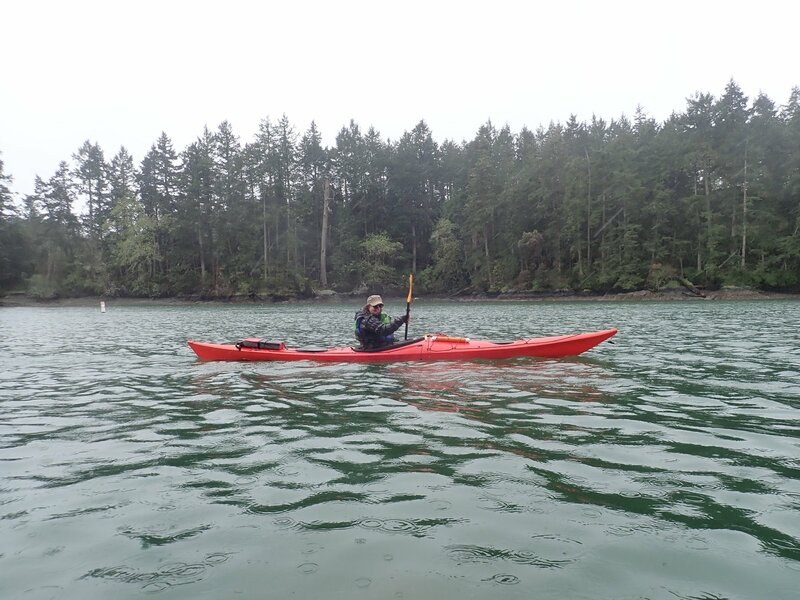 Despite the rain and the wind, the kayaking in Peddar Bay was fantastic. I saw one otter, and then another and then realized they were all around us. I had just enough to wet (pun intended) my appetite. Now we have the certificate we need to use the VCKC kayaks. Most of the participants showed up for that reason. I also came away with a whole new appreciation for ocean kayaking. This is not the Pelican in the river. I actually feel less confident, but also pumped to get out there. The next course is level 1 and is on my horizon, but they ask you have a years’ paddling experience. Roger that. See you on the Gorge, classmates.